(11/P138) TRENTON – A host of environmental, student, business, science, and civic leaders from across New Jersey are being recognized for their ideas and commitment to protecting and enhancing our state’s environment, as they will be named winners of the 2011 Governor’s Environmental Excellence Awards at a ceremony to be held tonight at the State Museum. Projects and concepts honored include planning initiatives to incorporate green design, transportation, and open space preservation; engaging the public to reduce the use of fertilizers and harsh soaps from entering streams and waterways; building innovative solar, wind and landfill gas energy projects; promoting recycling efforts in their communities; and restoring wetlands in public spaces, among others. Three of the winners highlight local initiatives to promote stewardship of Barnegat Bay. The Christie Administration has made restoration of the bay from decades of ecological decline a key environmental priority. This is the 12th annual awards ceremony. It became known as the Governor's Environmental Excellence Awards in 2006. Coordinated by DEP, the program is sponsored by the New Jersey Corporation for Advanced Technology and the New Jersey State League of Municipalities. A panel of judges accepted more than 60 nominations that featured unique or valuable environmental concepts or activities. To learn more about the Governor’s Environmental Excellene Awards visit www.nj.gov/dep/eeawards. ACUA is recognized for its solar, wind and landfill gas energy projects. Projects include a 500-kilowatt solar array, 7.5-megawatt wind farm and 5.4-megawatt landfill gas-to-energy project, which provides 100 percent of the electricity needed to power facilities operating in ACUA’s 360-acre Environmental Park solid waste facility. The ACUA provides wastewater and solid waste recycling services to the 274,000 residents of Atlantic County. Ocean County is recognized for its boat effluent waste removal program for Barnegat Bay. Since its inception in 1998, 727,000 gallons of effluent have been removed from holding tanks of boats that may otherwise have been discharged directly into the Barnegat Bay estuary. NJCF is recognized for its wetlands restoration project at the 9,400-acre Franklin Parker Preserve located in Burlington County, in the Pinelands National Reserve. Partnering with the U.S. Department of Agriculture’s Natural Resource Conservation Service, when completed, this project will convert 1,100 acres of cranberry bogs, blueberry field and disturbed agricultural wetlands back to natural wetland communities. The American Littoral Society is recognized for its “Bayscape for Barnegat Bay” program which encourages responsible landscaping practices around the bay. This program includes education through workshops and in-ground demonstrations, plus partnerships with business, homeowner associations and residents. 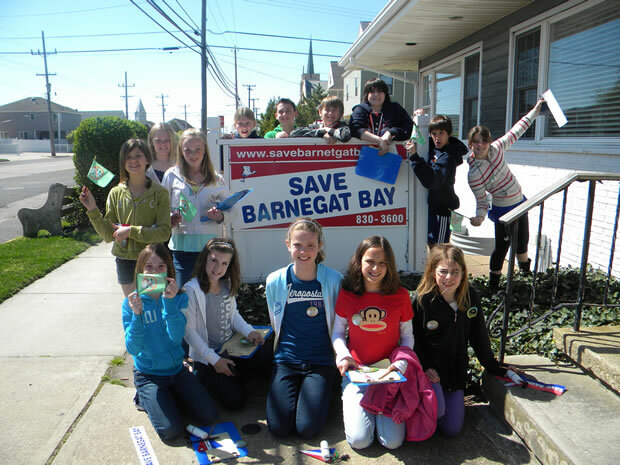 In 2011, the program added a Bayscape for Barnegat Bay retail garden center to further promote the sale of native plants in the watershed. The Johnson & Johnson Information Technology Center is recognized for its unique solar array and stormwater management project. Solar canopies installed over parking lots will produce 2.1 megawatts of power. Stormwater diverted off canopies, which would otherwise run off into the parking lot, will recharge ground water and go to a collection tank to be used to irrigate lawns at the site. Operating in 16 of the state’s 21 counties, New Jersey Audubon’s SAVE initiative has found an innovative and practical way to conserve land by developing a program that makes it economically viable for participating farmers to grow black oil sunflowers for birdseed. Incorporating aspects of the locally grown movement, it guarantees participating farmers a set price and an established market for sunflower seeds through Audubon’s 22,000 members. In addition to preserving farmland, revenue from every bag of birdseed sold goes to protecting critical wildlife habitat, including restoring 70 acres of native grasslands at a state wildlife management area this year. The Jersey City Green Committee is recognized for its comprehensive sustainable redevelopment planning initiatives, incorporating green design, transportation, urban agriculture and open space preservation. The committee developed many sustainability policies resulting in reduced energy and resource consumption, enabling healthier lifestyles and advancing environmental stewardship. Grow it Green Morristown is recognized for its community garden program utilizing underdeveloped land and donating produce to local food banks and soup kitchens, including more than 2,000 pounds of food this year. Rutgers Cooperative Extension of Essex County is recognized for its sustainable landscaping and stormwater management training program for military veterans. Through a partnership of Rutgers Cooperative Extension, the Planetree Corporation, and the Veteran Affairs New Jersey Health Care System, unemployed veterans are trained through a green job skills program based at the East Orange Veterans Affairs Hospital. Lavallette Elementary School 7th graders, their teachers and parent volunteers are recognized for their “Nix Nitrogen ‘N Nettles Now“ Barnegat Bay nitrogen reduction education program. The students’ efforts have led to an increase in public awareness in their barrier island community and have encouraged residents to reduce the amount of fertilizer they apply in their yards. Victoria Pan, a Ridgewood High School senior, is recognized for her energy conservation and recycling efforts at her high school. She is also recognized for her significant accomplishments providing outreach to other schools so they may duplicate the successes. Valerie Montecalvo is honored for her leadership efforts in the field of recycling and her company’s commitment to alternative energy. Under her leadership, Bayshore Recycling operates an array of permitted recycling facilities with a combined capacity of over 10,000 tons per day. Moreover, in 2008, $5.7 million was invested for a 679-kilowatt rooftop solar energy system that assists in powering the day to day operations. NOTE: This year’s award ceremony will be preceded by a tour of the “Essential Life” exhibit by Maplewood artist Tricia Zimic that focuses on wildlife conservation. The exhibit is on view through Feb. 19, 2012. MEDIA NOTE: Ceremony photos will be posted on the DEP main website on Friday. Media may download these photos or request additional photos by contacting the DEP Press Office. Photos of the Lavallette Elementary School students are available by contacting the Press Office. Imagine living on a narrow barrier island – the Atlantic Ocean to your east and Barnegat Bay to your west – and looking forward to dips in the bay during the summer months. But once you the bay’s shoreline and wade in, you have to turn back around because you are greeted by the painful stings of sea nettles. 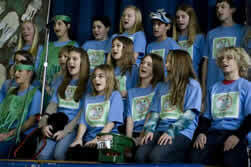 That was the reality that 21 seventh graders from Lavallette Elementary School faced two years ago. When they started investigating that problem in the classroom, they suspected that a contributing factor in the increase in the occurrences of jellyfish could be stormwater flowing into Barnegat Bay. That’s when they took action and formed “Nix Nitrogen ‘N Nettles Now.’’ The student group has spearheaded public awareness campaigns to encourage residents to reduce the amount of fertilizer they apply to their lawns and in their yards. Their efforts stood out in the eyes of judges for the 2011 Governor’s Environmental Excellence Award. The Lavallette Environmental Club is the winner of the “Environmental Education & Student Activities” category. Since May 2010 the students have educated their classmates, the general public and elected officials at nearly a dozen events including assemblies and festivals. They even presented their project at a joint New Jersey Senate/Assembly hearing where they received a standing ovation. The students have also been recognized nationally, finishing second among 131 entries in the Disney Planet Challenge Award in April 2011. Their awards have totaled over $10,000, with proceeds benefitting bay preservation projects. On top of these accomplishments, the students set two world records including the greatest number of jellyfish hats and the greatest number of jellyfish scarves worn at one time, as documented by RecordSetter.